RPE Pond Liner - Aquatic Biologists, Inc. Aquatic Biologists, Inc. takes pride in the high quality of pond liner material we have available for our clients. All liners are custom fabricated at the time of order. Allow 1-2 weeks for fabrication and delivery. For liners shipping outside of our normal delivery zone (i.e. AK or HI) call 1-800-442-6648 during our normal business hours to place your order. For additional information regarding shipping please see below. ABI’s Premium Grade Reinforced Polyethylene pond liners (RPE Pond Liners) feature both a high puncture and tear resistance - stronger than EPDM, PVC and HDPE liners. Our pond liners are made to stand the test of time which is why each liner features a high UV resistance and won't degrade when exposed to chemicals such as fertilizer nitrates and hydrocarbons. Because leaks are difficult and costly to detect and repair, it's usually best to use a single piece of liner large enough to fit your entire pond to minimize the risk of a seam leaking. Our pond liners can be custom made into single panels up to approximately 60,000 square feet in size! 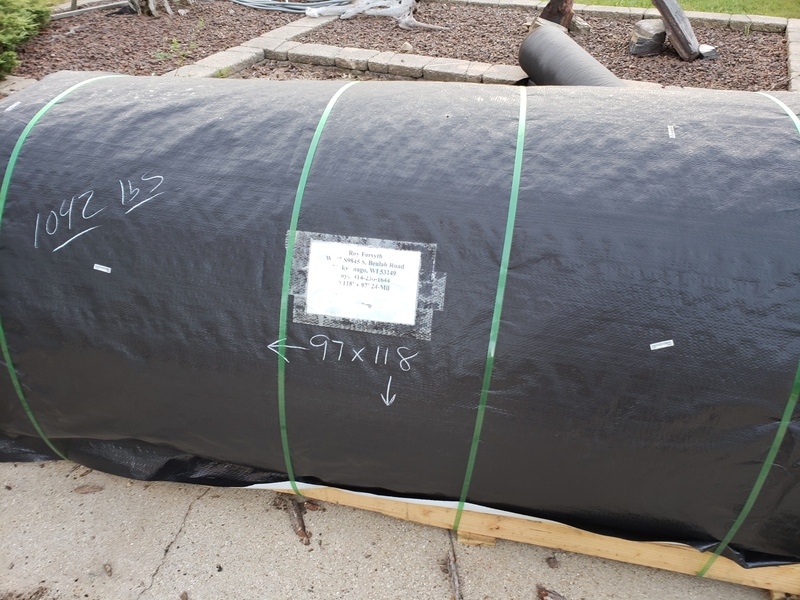 ABI’s RPE Pond Liner is roughly 1/3 the weight of Firestone's pond guard EPDM rubber liner, making it much easier to handle and install. The main purpose of our pond liners are to hold water while creating a healthy aquatic environment. With this in mind, our RPE Pond Liners are engineered to be safe for fish and plants. ABI’s RPE Pond Liners are available in standard strength (24 mil single ply) and super-strength (24 mil three ply). In most cases, our standard strength liner will be suitable for the most ponds though some may require a stronger liner. For example: if your dog will be swimming in the pond where its sharp claws may come in contact with the liner ABI suggests using the super-strength thickness. Please see the specification chart below. Below are a few basic examples illustrating how to measure a pond. If the pond is empty, measure from the anchor trench or shelf down the slope, across the bottom, up to the limit of the trench or shelf in both the widest length and width. It is always best to measure your pond when it is empty, but at times this might not be possible. If the pond is full, measure your ponds widest width, longest length and deepest depth (in feet). Please note: the pond will need to be drained prior to installing your new pond liner. As such, we recommend draining the pond and verifying your final liner size prior to ordering. When constructing a larger pond, you may need to use additional liner to securly anchor the liner in place. Additional measurements may also be required. For large ponds consider using 2 -4 feet of liner on each side. We recommend contacting one of ABI's trained professionals when calculating the liner material required in ponds a 1/3 of an acre or larger. The liner roll will be marked (typically on the roll itself and on the exterior wrapper) with the length, width and directional arrows. This signifies that your bundle will unroll 118’ and then unfold 97’. Once the bundle is lying flat along the ground, have all available helpers spread out evenly and pick up the top/leading edge, and pull the liner across the pond 97’. (We recommend having at least one person every 12-16 feet along the edge, to help pull the liner evenly across the pond). Please note: When panel sizes are larger than 20,000 SF, it is typical to use a beam and spreader bar to lift the roll with a backhoe or other equipment to unroll it. Once the liner is loosely laid over the pond excavation, begin smoothing the liner down to get it as flat as possible. Leave at least 2 feet of pond liner around the entire pond edge so the liner can be anchored in place by either digging an anchor trench, or by covering it with fill. To make your RPE Pond Liner look natural we suggest covering the pond liner with sand, rocks, plants, etc. above the water level after it has been unrolled. This will also protect the pond liner from long-term exposure since even the most UV stable products can lose their flexibility over extended periods of time. Geotextile should be used when placing soil or sand on top of the liner to prevent the sand/soil from sliding/slipping down the slope. It is extremely important to anchor your RPE Pond Liner in place to prevent the liner from sliding down the slope and into the pond. The most common way to anchor the liner is with an "anchor trench,” typically 1 foot wide by 1 foot deep, or larger. 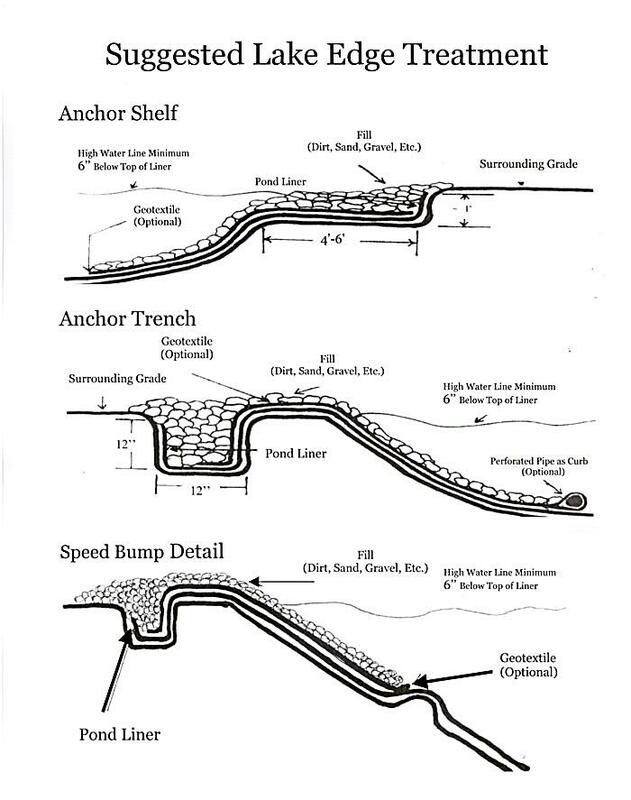 The most common variation on the anchor trench is the "anchor shelf or bench.” Rather than going down into the ground, the shelf is a flat horizontal (or slightly canted back) area about 4 feet wide that the liner is laid onto, then buried. This method is more popular as the size of the pond gets larger. It also tends to be a little more "forgiving" when attempting to grow grass right down to the water’s edge. Either method is perfectly acceptable and commonly used. The deeper the pond the larger the anchor trench should be. ABI’s RPE Pond Liners are manufacturer warranted to be free of material defects for up to 25 years (coverage length determined by liner thickness). This includes the ability of the liner to withstand normal weathering and environmental degradation. The warranty does not cover damage resulting from catastrophic natural events (example: earthquake damage), failure to completely cover the liner in its entirety, improper installation or use (examples include: damage by machinery or other equipment, people, animals, ice, or sharp/rough objects in the substrate). All liners are custom fabricated at time of order - allow 1-5 business days for fabrication to be completed. Liners weighing less than 150 lb. are packaged into a box and shipped via UPS ground, which takes between 3 to 7 business days depending on your location in the USA. Anything larger is shipped via freight truck on a pallet. Someone must be on location to take delivery of orders shipped via freight truck with a means by which to unload the shipment. What are the Advantages of an RPE Pond Liner (reinforced polyethylene) vs. EPDM? The main advantage is the strength and weight of the liner. RPE Pond Liner is considerably lighter than EPDM, and even though it's thinner, it is more puncture resistant. In some cases, no underlayment is need if the RPE Pond Liner is being placed on regular soil or sand. When is the use of a geotextile (under/overlayment) recommended? Requirement of a geotextile underlayment (under the liner) with our pond liners is relatively rare. It is always a judgment call, but we don't require the underlayment unless it is impossible or impractical (cost ineffective) to achieve an acceptable subgrade any other way. Underlayment is also used to allow gasses, such as methane to escape from under the liner or between the liner and fill material such as rock, gravel, rip-rap, etc. Use of over/underlayment is an option and not mandatory in most cases. However, it is popular for many reasons. We know from experience that physical damage (from deer, kids with rocks, mechanical equipment, UV degradation, etc.) most often occurs on the upper edges of the pond liner. Also, an added degree of safety is introduced; the upper edges are made less slippery so kids, dogs, deer, etc. can get out more easily. Is ballast material necessary to hold the liner down and keep it from floating? It's a good idea to strategically place sand, small gravel, or heavier objects (such as fish structures) strategically placed throughout the pond. What is the maximum size of ballast material allowed before a protective layer is required over top of the liner? For ballast material, we typically say gravel less than 1" in size doesn't require a protective layer over top of the liner. The larger the aggregate size, the more likely it is to damage the liner when spreading out the material, so if using a 1" piece, spread the material out carefully. If using ballast over 1" in size that has sharp corners and edges (like crushed gravel), we recommend a protective geotextile fabric to help prevent damage to the liner. Is there anything to keep in mind when covering the liner with ballast (i.e. sand/gravel/clay)? A maximum slope of 6 to 1 is recommended if no geotextile fabric is placed on top the liner. Anything steeper may result in the ballast material sliding down the liner into the middle of the pond. Steeper slopes can be achieved by adding a geotextile fabric over the liner. *All data and material comparison information has been provided by the manufacturer. Sleeve Kit (Pipe Boot) 1" - 6"
Sleeve Kit (Pipe Boot) 6.5" to 12"